Nine-year-old Destiny Chase was playing hide and go seek in the woods near her house earlier this month when she pricked herself with a discarded hypodermic needle. Now she will have tests done to see whether her life is going to change dramatically. Over the next six months, Chase will undergo a battery of blood work to see if she has contracted any communicable diseases through the needle, most notably hepatitis and HIV. The incident is alarming for her parents, who said they are worried about their daughter’s health and anxious to let other parents know about the possible dangers hypodermic needles pose to kids in Westbrook. Chase said she found the needle in a section of woods near her house on Brown Street near the Dana Warp Mill. The woods are on a small parcel of city property between Brown Street and Dodge Street. The woods are not maintained by the city and are littered with trash, broken glass, beer bottles, and, evidently, hypodermic needles. The city has many small pieces of land, like the one near the Chase home, according to City Planner Brooks More and Economic Development Director Erik Carson. Land is often left over after residential housing developments are built. The land near the Chase home appears to have been designated as a right of way for a street that was never built. Police Chief Paul McCarthy said these areas attract kids Destiny Chase’s age as well as teens and illicit drug users, and keeping them out is difficult. He said police have repeatedly fenced off Saccarappa Falls only to have teens rip down the fences to go swimming. What police can do, he said, is work with residents to clean these areas up. According to Don Chase, the land near his home is a commonly used path connecting Brown and Dodge streets, but it’s also a place where people go to drink and take drugs. He said he’s seen parents with a baby stroller come through there, and he’s also caught teens smoking marijuana there. Don Chase was at home when his daughter stuck herself with the needle. She told him she had intended to take it to her friend’s father. But first she took off the cap to see how sharp it was. While trying to put the cap back on, she pricked herself in the palm, which immediately began to bleed. Destiny Chase ran home, where her father cleaned the cut and called the police, who told him to take Destiny to the hospital and get her checked out because of the drug use prevalent in the neighborhood. Some time later School Resource Officer Brian Dell Isola heard about the incident from a staff member at the Congin School, where Destiny Chase is in the fourth grade. Dell Isola said he contacted the Chases and visited the woods with the Chases. Dell Isola searched the woods and found two more hypodermic needles. Afterwards, he informed some parents waiting at the school bus stop about what had happened and told them to alert other parents to keep their children out of the woods. McCarthy said it is not terribly uncommon for residents to find discarded needles. He said police find needles about 10 times a year on average, rarely in the same place. There can be as few as just a couple or as many as 30 to 40, he said, and they assume they’re for illicit drug use. According to Detective Pat Lally of the Maine Drug Enforcement Agency, hypodermic needles are used illegally for injecting heroin, morphine, cocaine, and prescription medications, such as oxycodone and other synthetic opiates. Drug users usually dispose of their needles in a somewhat secluded area where they feel safe using drugs without being seen, said Lally. The Chases have a nerve-wracking six months ahead of them before they know what their daughter’s future holds, according to Ellen Hathaway, a registered nurse who is the manager of employee health at Maine Medical Center. The first step, Hathaway said, is to determine whether she has been vaccinated for hepatitis B, which most children these days are, and whether she has developed immunity. If she has, hepatitis B is not a concern. If she hasn’t been vaccinated or hasn’t developed immunity, she will be given a hepatitis B globulin shot, which gives immediate but short-lived immunity. She will also be given the hepatitis B vaccine immediately and another globulin shot a month later, as well as a tetanus shot if necessary. Hathaway said if it’s caught early, hepatitis B is easy to treat. The second step, according to Hathaway, is to do blood work for hepatitis C. No vaccine exists for hepatitis C, but if recognized and treated early, treatment does well, she said. Because there’s no vaccine, all the Chase’s can do is get lab tests done over six months. If the tests are clean after that time, she’ll be considered fine as far as hepatitis C is concerned. However, it’s “a very, very anxiety-provoking time, even for a healthcare professional who knows what’s going on,” she said. The final step is blood work for HIV, which is the most worrying process, she said. Because there is no vaccine for HIV, all the Chase’s can do is take the tests and wait. If the user of the needle is known and known to be a risk, Hathaway said a patient would be put on HIV medications. However, she said in this case, the risk is unknown but lower. HIV does not survive more than a few days normally in dry environments outside the body, such as in a needle in the woods. HIV is statistically the least likely thing for Destiny Chase to have contracted. Hathaway said the risk of getting hepatitis B from an exposure is 30 percent, the risk of hepatitis C is 3 percent, and the risk of HIV is 0.3 percent, according to Center for Disease Control reports. Hathaway said Destiny Chase is lucky because she lives in a low-risk state for HIV. She also said other students at Congin should not be concerned because any virus would have to be passed through bodily fluid, such as blood or spinal fluid and not through saliva, mucus, vomit, urine or feces. Vicki Chase said she and her husband haven’t talked much to their daughter about this because they don’t want to scare her. “Destiny’s not scared,” she said. “She doesn’t realize what the possibility is.” She said they’d address it when the time comes, if it comes. That time could come as early as March 31, when Destiny is scheduled for her first test. 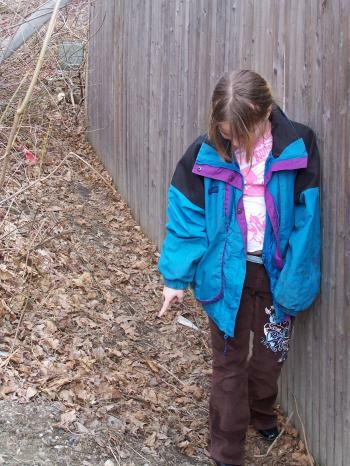 Nine-year old Destiny Chase points to the ground in a section of woods near her Brown Street home where she found a discarded hypodermic needle. 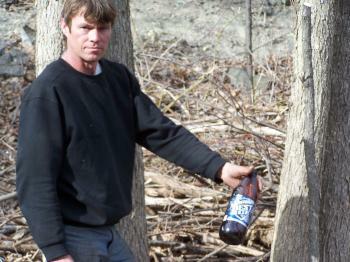 Don Chase of Brown Street holds up an empty beer bottle found in the trash-littered woods near his home where his daughter found and pricked herself with a discarded hypodermic needle. 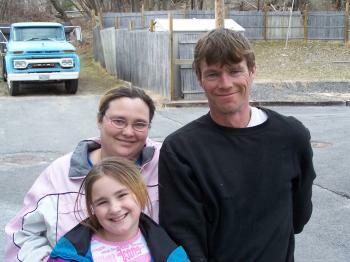 Don and Vicki Chase pose happily with their daughter Destiny, who on March 31 will begin tests to see if she contracted hepatitis or HIV from a hypodermic needle she found in the woods.